So I bought the X1 Carbon Generation 3 ! It arrived 2015-02-17 after ordering it on the 2015-02-09. It feels like bloody Christmas !! I love how quiet this machine is. The model number on the order is 20BTCTO1WW. Lenovo's Safety and Setup Guide refer to this as Machine Types: 20BS and 20BT. Serial number is R90F6C3B which is confirmed by /sys/devices/virtual/dmi/id/product_serial. Usual bunch of stupid pieces of paper and ugly fingerprints! It's well packed though. The X1C3 feels like it might not survive a drop as well as my X220. It also worryingly doesn't have spillage holes. I am wondering about a sleeve to put it in, in order to prevent scratches and the sort whilst it travels in my pannier. Sadly I found the Archlinux dual boot documentation a bit lacking. I was going to attempt dual boot, but I couldn't understand how to resize the Windows NTFS partitions. So I just gave up. Also I was put confused by the UEFI BIOS stuff. Oh well. Syslinux install was also a little confusing. Do I run it in the arch-chroot or not? syslinux-install_update -i -a -m worked from within the chroot, but the default grep root /boot/syslinux/syslinux.cfg was APPEND root=/dev/sda3 rw and not /dev/sda1. 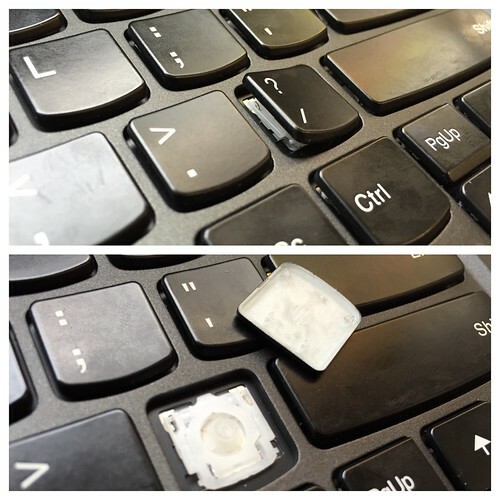 Both the Trackpoint & TrackPad now work with xf86-input-libinput and kernel 4.3! Make sure you purge any old stuff in /etc/modprobe.d/psmouse.conf! Somewhat annoyingly my wifi0 is called wlp4s0 and my eth0 is called enp0s25. Got to thank systemd for that. Both interfaces "just work" and perform great! Hint if /var/run/systemd/resolve/resolv.conf is missing, you need sudo systemctl status systemd-resolved and then enable it. Tethering from my iPhone6 works once usbmuxd is is installed, the interface name is enp0s20u1c4i2. I've experienced a wireless issue, but I think it's more a TP-LINK AP issue. Update: Frequently get thrown off the wireless network, so I'm relying on the ThinkPad Ethernet Expansion Cable heavily. Different spacing to the X220. I don't like the grease marks my sweat leaves behind. Thankfully this machine runs cool, like 42C atm, so already that's way way more comfortable than my old X220 Thinkpad. I've discovered I need function lock on, enabled by Esc+Fn with a green light coming on on the Fn, in order to use the function keys. I have figured out how to bind the volume and brightness controls in my dwm configuration. 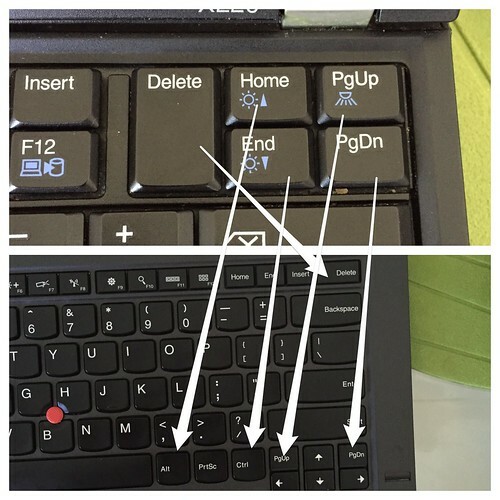 I've overrided mapping the Thinkpad keys as above using Xmodmap to help me find the Home/End keys better. I'm enjoying the 1920x1080 (aka 1080p aka FHD) screen so far, especially since I more room to tile two windows side by side in dwm. Didn't have to do anything special so far to resize anything. google-chrome-unstable and st's static char font = "Terminus:pixelsize=18"; is serving me well! This is how much bigger my irssi/tmux session is now compared to my X220! Here you can maybe see the colour reproduction difference with a side by side comparison against the X220. Tbh, I'm not that happy with the way the X1C3 reproduces yellow. It's way too close to white. When I slouch, I notice the viewing angles are not good. Can't get sound to output on HDMI. ioquake-git works better than quake3 from AUR. At least I can go full screen now. Just that my mouse doesn't work. It seems to be locked to 60fps and I haven't worked out how to turn off vsync. I needed to backup a nearly broken exfat 1TB USB3 drive to a newer USB3 2TB drive formatted in glorious ext4. Using sudo rsync -Part --exclude=". *" --exclude ".*/" . /mnt/2tb/recovery/ I'm getting 90Mb/sec across the USB3 bus. Actually it seemed to speed up since it copied the 400+GB in 2 hrs, not the calculated 11. Any ideas how to better calculate this? I ran into this Archlinux slow DNS resolving bug. Since disabled ipv6.